Summer's coming, hence the beach parties are starting. 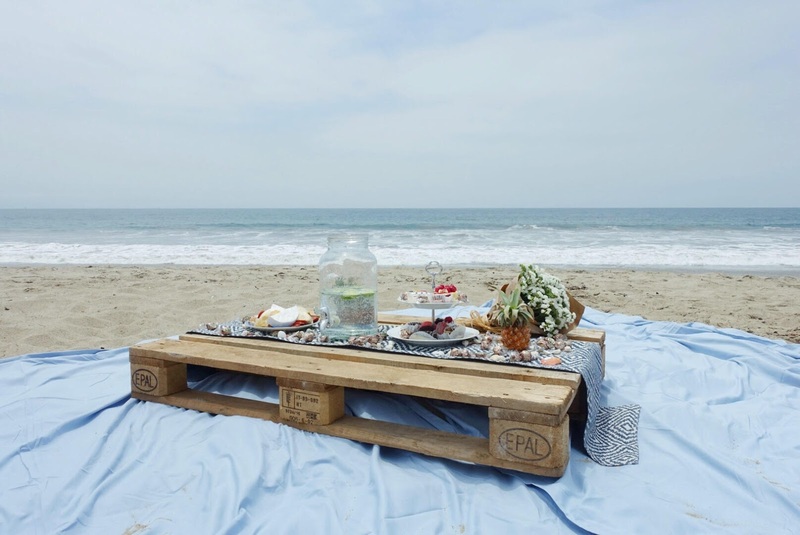 And just in time for Memorial Day I have another fun beach picnic setup for you to recreate this weekend. Last Saturday was my fiancé Arthur's birthday and so of course I did what I love to do, elevating the simple things in life. So when he asked for a fun day at the beach, I answered. We had about eleven friends join us for the day and it worked out great. I probably won't recreate this for the long holiday weekend but I encourage you all too! Here are all the details, enjoy! 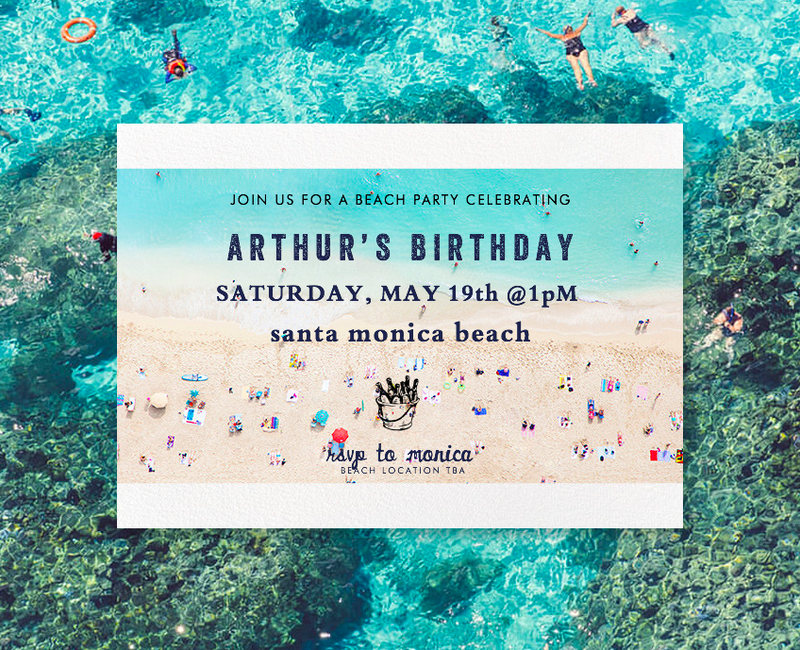 THEME, TIMING & LOCATION: The theme for Arthur's birthday was the start of summer, just like Memorial Day! I really just wanted everyone to feel relaxed and have a nice day at the beach. So I started with the invitations, which Paperless Post of course had covered with it's new Gray Malin collaboration. Next step was finding a good location on the beach that wasn't too crowded, aka avoiding Venice Beach and anything close to the Santa Monica Pier. After heading a bit north, I scouted a small parking lot and a big wooden fence, which would serve as a great landmark for guests. I found a spot on the beach right above the break in the sand, so we could easily see the waves crash in. I highly recommend doing this for your own nice view but also so the pictures have the ocean in them, just saying! Then I dropped a pin to send to guests to make it simple and avoid fifty calls back and forth to find us. Fortunately the weather that day was perfect, not too hot but with enough sunshine and little wind for everyone to be comfortable. If it's chilly that day I recommend grabbing some blankets like I did last time, like these $2 ones from Ikea. 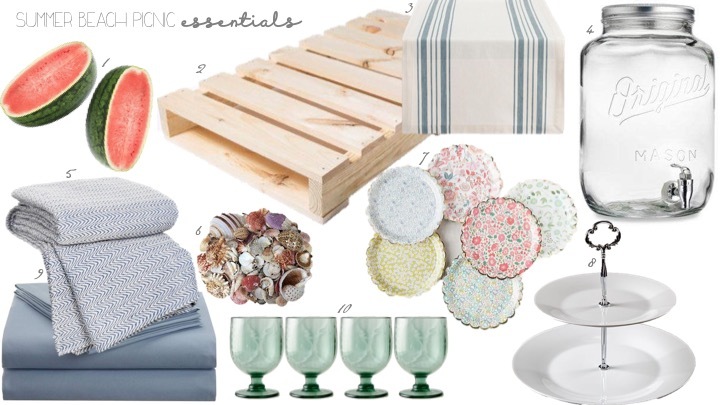 Since the theme was summer at the beach I went with variations of blue to match the waves and sky, and it looked wonderful with the wooden pallet, as pretty much any bright color would. THE SETUP: Since I was inviting more than a few friends I wanted to make sure we had enough table space to gather around so I immediately I figured we needed some kind of flat table surface. Last time I used a few small wooden crates and lined them up to make a table, which worked really well but didn't provide a wide enough space for everything. So this time I took an idea from my friend Brooke who used a wooden pallet as a wide surface table and it worked out perfectly! She even had a great place to find them right in Santa Monica but you can find them at any type of construction or hardwood store or here at Walmart. Just call ahead and ask if you can have a wooden pallet, pretty much all places that house large pieces of furniture or building materials will have them since they use them to stack heavy items on top of each other and maximize space. Most are likely to give them to you for free or for very low cost. I placed the wooden crate onto several baby blue flat sheets and used watermelons as weights for the corners of the sheets. I found an amazing little table runner to add a bit of sophistication without sacrificing the rustic feel of the wooden pallet and it turned out just right! I found mine at Tuesday Morning in Santa Monica but there are many cute ones you may even want to keep after the picnic! Then I sprinkled some sea shells and chocolate truffles (just for my fiancé and his major sweet tooth) as decor. I had a plastic vase for the flowers but since Whole Foods wrapped them so well I just stuck the arrangement in between two pallets and called it a day. THE FOOD/DRINK: I wanted to have some easy summer snacks for everyone so I ordered an assortment of wraps from Simply Salad's catering menu for people to munch on. Of course I also had the usual chips and guacamole spread, and as always, a delectable cheese plate. On my cheese plate were the basics like brie, manchego, and blue cheese with some great accoutrements like toffee almonds, a raw honeycomb and pepperoni slices to pair. Since Arthur loves desserts I made sure to get a cute little cake stand and fill it up with tons of pretty options. 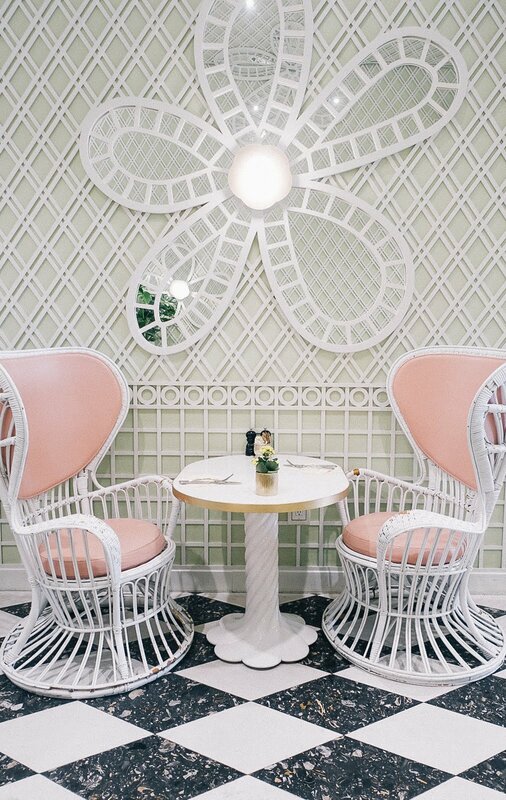 Vienna Pastry has such a wide selection of adorable little treats and cakes and is extremely reasonably priced! To drink I made an extremely simple vodka soda punch as that's his favorite drink and added some limes for flavor into my mason jar dispenser. I love how summery it looked along with the wooden pallets.